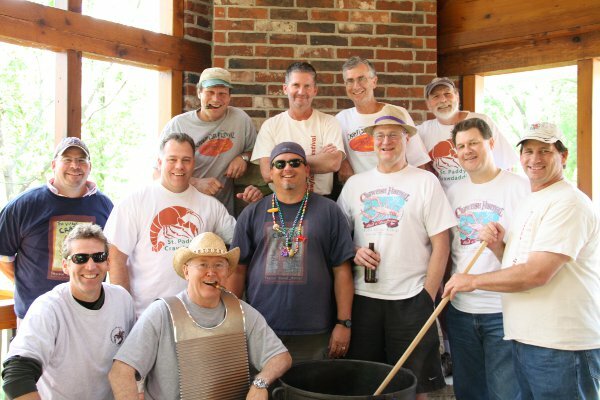 The Village Crawfish Festival event is organized and hosted by the Secret Order of Crawdaddies Inc. a 501(c)(3) organization, headquartered in Prairie Village, Kansas. The SOC is committed to supporting Kansas City children's charity (raising funds and awareness of), providing a unique function for the community and enjoying fraternity among its members. Simple Beginnings: It all started when a couple of SOC founding members were craving boiled crawfish back in 2001. These two crawfish enthusiasts held their first annual boil inviting 30 people to share a hundred pounds of live crawfish flown from New Orleans to Kansas City for the party. The challenge was their friends didn't know how to peel the little crustaceans so a lot of time was spent giving peeling lessons. Those same friends are now skilled peelers and connoisseurs. Each year the invitation list grows as the word spreads. Supporting Local Charities: The Crawfish Festival is a single fund raising event for the purpose of supporting local Kansas City children's charities. In 2008 the proceeds went to Children’s Mercy Cancer Center Auxiliary. In 2009 and 2010 the proceeds went to Head Start of Shawnee Mission. In 2011 the proceeds went to Head Start of Shawnee Mission and Kansas City Young Audiences. In 2012 the proceeds went to Gillis and Kansas City Young Audiences. In 2013 the proceeds went to Gillis. In 2014 the proceeds went to Head Start of Shawnee Mission. In 2015 we raised over $40,000 for reStart. And in 2016 we beat that and raised over $50,000. And in 2017 we raised over $35,000 for reStart. That's $125,000 for reStart over three years! We're hopping to break records again in 2018 and all the proceeds will go to Kansas City Community Gardens (KCCG).